1. Mukaddime is a scientific international refreed journal which is published twice, in Spring and Autumn, by Social Sciences Institution of Mardin Artuklu University. 2. In the journal, apart from originally copyrighted articles from all social sciences branches, edition-critical and book evaluation studies are published. 3. Publication language of thejournal is Turkish. The writings sent at the other languages are evaluater by the editorial board. 4. It is necesaarry for the writings sent to the journal not having been published before or not to be the evaluation process of another journal. 5. Notifications presented at scientific meetings can be published if the necessary explanations are made. 6. The writings sent to be published have to be suitable for the research and publication ethics. All the articles passing pre-evaluation of editorial board will be scanned by iThenticate programme. The ones which are not suitable for scientific acceptibility report will be refuted with out evaluation of refree. 7. The copyrighted articles sent to Mukaddime to be published are sent to two specialist via ”blindrefree” after being evaluated by editorial board. Incase of disagreement between these two refrees, it is consulted to a third refree.The article is publishedif at least two refrees approve it. By sending reports of refrees, whetwiter is informed. 8. If one or both of there srees say/s “it can be published after correction” the article is sent to the writer for necessary correction. After the correction, it is evaluated by there free or editorial board to see whether it is done or not. 9. Editorial board decides the publication of book evaluation writings. 10. Minor corrections can be made by editorial board during publication process. For writing of articles Writing Guide of Turkish Language Institution is taken in to consideration. 11. 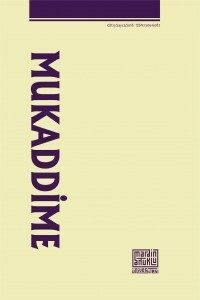 The copyright of the writings published are acceptedto be belongto Mukaddime. All legal responsibility of the writings about language, wording, contentetc are belong to the writer. 12. The articles decided to be published are published in print an done sample of the published journal is sent to the writer/s, and any fee is not paid for the copyright. 13. When each issue is published, the articles are published as PDF at the http://mukaddime.artuklu.edu.tr website. 14. The writing applications can be sent to the address of Mardin Artuklu University Social Sciences Institution Health Highschool Building 5th floor on Diyarbakır way 5th km Mardin. As digital sample they can be sent tohttp://mukaddime.artuklu.edu.tr. 1. The articles must be between 5.000 – 8.000 and book evaluations must be between 1.500-2.500 words. The studies not matching this are evaluated by the editorial board. 2. There must be two abstracts both in Turkish and in English consisting of at most 125 words and having titles and keywords sections. On the first page of the article writer’s / writers’ title, institution and address data must be added. Bibliography must be added at the end of the writing. 3. Writings must be written withPC Microsoft Office Word (Word 97or a betterversion) or by adapting to this programme must be sent as Word and PDF formats. 4. Page lay out; must be A4 size, margins must be 3 cm from left, 3 cm from right, 3 cm from up and 3 cm brom bottom. 5. The text part must be written in Times New Roman type with 12 sort; titles must be bold; all the text must be written1,5 line gap, and foot note must be written in oneline gap with 10 sort. For the quotations given in the text, the foot note writing rules are used, and the quotations must be writted as narrowed from sides apart from the text. 6. The drawings, graphics, pictures etc. must be in JPEG or GIF formats. Visual stuffand additions must be sent through e-mail if necessary. 7. The writer/s must use APA 6 bibliography at their articles. The bibliography must be given at the end of the text in an alphabetic order. Mardin, Ş. (2012). Jön Türklerin Siyasî Fikirleri (18.bs.). İstanbul: İletişim. Strunk, W. Jr. & White, E. B. (2000). The Elements of Style (4. Baskı). New York: Longman. Hunt, Lynn. (2009). Charles Tilly’nin Kolektif Eylemi, B. Skocpol (Ed.). Tarihsel Sosyoloji içinde (ss. 270-304). İstanbul: Tarih Vakfı Yurt Yayınları. Lewis, B. (2000). Modern Türkiye’nin Doğuşu (M. Kıratlı, Çev.). Ankara: Türk Tarih Kurumu. Karakelle, S. (2012). Üstbilişsel Farkındalık, Zekâ, Problem Çözme Algısı ve Düşünme İhtiyacı Arasındaki Bağlantılar. Eğitim ve Bilim, 37(164), 237-250. 3 Aralık 2014 tarihinde http://egitimvebilim.ted.org.tr/index.php/EB/article/view/779/376 adresinden erişildi. Aktay, Y. (1999). Aklın Sosyolojik Soykütüğü: Soy Akıldan Tarihsel ve Toplumsal Akla Doğru. Toplum ve Bilim, 82, 114-140. Binark, F. M., Çelikcan, P. (1998). Mahremin Müzakereye Çağrılması ve Yıldo Örneği. Kültür ve İletişim, 1 (2), 197-214. Conway, P. (2003). Truth and reconciliation: The road not taken in Nambia. Online Journal of Peace and Conflict Resolution, 5 (1). (varsa doi numarası, yoksa URL verilir. URL örneği: http://www.trinstitute.org/ojpcr/5_1conway.htm Kaynağa ait sayfanın adresi (URL) ya da varsa sadece doi numarası yeterlidir. Editorial: "What is a disaster" and why does this question matter? [Editorial•]. (2006). Journal of Contingencies and Crisis Management, 14, 1-2. Bruni, F. (2003, 26 Aralık). Pope pleads for end to terrorism and war. New York Times. Leblebici, E. (1991). Gündelik Hayat Olaylarına İlişkin Atıfların İncelenmesi. Yayımlanmamış doktora tezi, Ege Üniversitesi, İzmir. Pekasil, T. (2012). Toplumsal Statü Göstergesi Olarak Dini Otorite Tipleri: Cizre Örneğinde Şeyh, Molla ve Seyyidler. Cizre 14-15 Nisan 2012 içinde (s. 141-154). İstanbul: Sanart Ajans. UNESCO. (2013). World Heritage list. UNESCO web sitesinden 10 Kasım 2015 tarihinde http://whc.unesco.org/en/list adresinden erişildi. Author must perform the registration process before the submission of article. Please click on the Login link on the site for submitting your article. You can also read and comment on the articles in our journal. Libraries and research centres can include our journal in their list of the electronic journals. Detailed information about ADS (Açık Dergi Sitemleri) can be found from Public Knowledge Project link. Authors may cite their articles in this journal on their personal website or in institutional archives with the reference of this journal according to respective library rules before or after the publication process. The journal is being published in two volumes a year in the spring and fall with a intervals of six months. This journal; adopts the principle of making scientific research available to the public for free of charge and with the idea of sharing scientific information globally by providing instant open access to its contents. The names and e-mail addresses on the website of this journal will only be used for the purposes of Mukaddime. They will not be opened to other people in any case or used for any other purposes. Without permission, the submitted or published articles in the journal cannot be used or published partly or completely in any other place. The preview editing phase is aimed to scan plagiarism as well as to improve the fluency, clarity, grammar structure, word selection and appropriate format of the article. This is the last opportunity for authors to the necessary changes in their article, because, only sorting and formative corrections will be done after this stage. The file that will be primary edited can easily be edited as a word processing document since it is formatted in MS Word or .rtf file. Two approaches are proposed here for primary editing. The first is to use the "Track Changes" feature of the MS Word program. However, the author, the preview editor and the editor of the journal must be able to access the program during this process. The second proposed system is to bring individuality of the article and accepted the research work in accordance of Harvard Educational Review. By modifying these instructions, the editor of this journal can make it to its own publication style. 1. The preview editor can do the necessary changes by the "Track Changes" feature of MS Word. The "Track Changes" feature can be found under Tools in the Menu bar. The attached texts are shown as erased or coloured at the margins with different colours and with the cross lines. Preview editor can write in the brackets (3rd brackets) if they have any questions or comments to author or editor. The edited document from the preview editor will be uploaded in the system after forwarding it to the editor. The editor will check the text and send it to the author. The editor and author will approve the corrections if they agree with the changes, then they will arrange it, change it, or if necessary, they will do new change and add new comments in different colours. If there are any questions in the brackets (3rd brackets), the author and editor should answer these questions in their respective brackets. After the author and the editor review and confirm their necessary changes, the reviewed copy will be rechecked by the preview editor one more time and the text will be considered as ready for final editing and sorting. Note: Please use the page numbers of the printed copy to give a page number as because the page numbers may change during electronic processing. The file of the preview editor The preview editor of the journal will inscribe and edit the article in terms of fluency, clarity, grammar, word choice and then will make the questions for the author with the necessary points. The completed article with this initial preview and edits will be uploaded onto the web page of the journal. A note will also be sent to the author for reviewing the article. Editing file from the author The author should check the editor’s reviews on the article and do necessary change before making major rearrangement to the format and structure of the completed original article. If the author finds the changes from review editing appropriate, he/she must approve the changes and answer all the questions from review editors. Authors can reject if he/she does not find the change appropriate. After doing this necessary change, author should rename the file from ‘Author’s nameQA.doc’ to ‘Author’s nameQAR.doc’ (Example: instead of ‘LeeQA.doc’, it will be ‘LeeQAR.doc’) and should upload the file on journal’s web page. Final stage of preview editing The preview editor of the journal will approve author's changes and prepare the final copy integrating the answers with the text. The page editor will notify the editor for completing the format after uploading the latest edition of the article on journal web page.